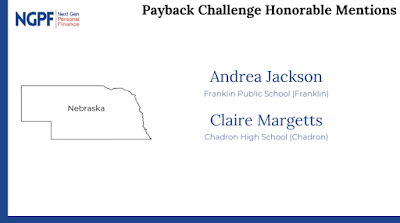 PALO ALTO, California, April 26, 2018- Next Gen Personal Finance (NGPF), a non-profit committed to ensuring that ALL students leave high school with the skills needed to thrive in an increasingly complex financial world, is pleased to announce two students from Nebraska have received an Honorable Mention Award in their inaugural PAYBACK Challenge. 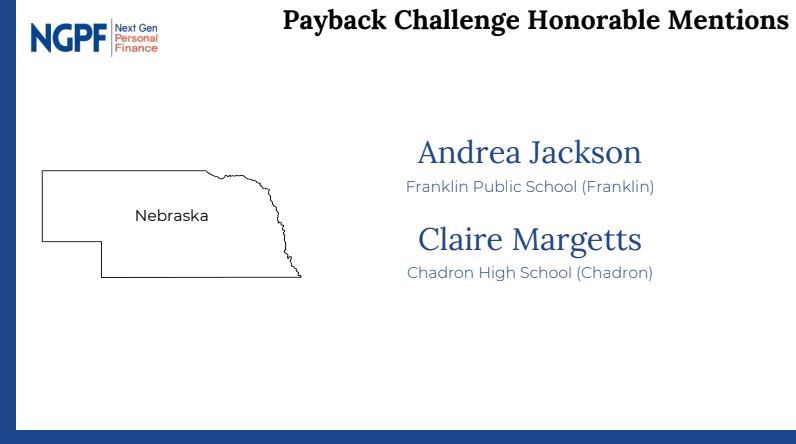 Congratulations to Andrea Jackson from Franklin Public School (Franklin) and Claire Margetts from Chadron High School (Chadron). Each of the 150 national Honorable Mention winners (listed here) will receive a $500 award from NGPF to be used for educational purposes. NGPF will announce the ten PAYBACK Challenge Finalists next Thursday, May 3rd. ● Indicates an understanding of key concepts learned by playing the game PAYBACK. ● Addresses concerns their parents/guardians may have about this sensitive topic. ● Takes a creative approach to engaging parents/guardians in a conversation about college. Each of the Honorable Mention winners will receive a $500 award from NGPF to be used for educational purposes. NGPF will announce the ten PAYBACK Challenge Finalists next Thursday, May 3rd. "After completing the game, I discussed strategic ways to lower college costs with my parents. I presented choices I made during the game, which spurred conversations of how to collectively save money." "Payback serves as an excellent tool. It showed me that paying for college is not only possible but manageable, and moreover, help initiate the conversation that desperately needed to happen between my parents and myself. College doesn't have to be impossible." "Payback is a simulation of the real college experience. It shows that college is truly a constant balance of focus, connections, happiness, and debt and that only with the right tools will one be successful." Parents are invited to attend a screening of the documentary "Angst: Raising Awareness Around Anxiety". Screenings of the 56-minute documentary are Monday, April 30th at 1 PM and 7 PM at Memorial Hall on the CSC campus. Admission is free. 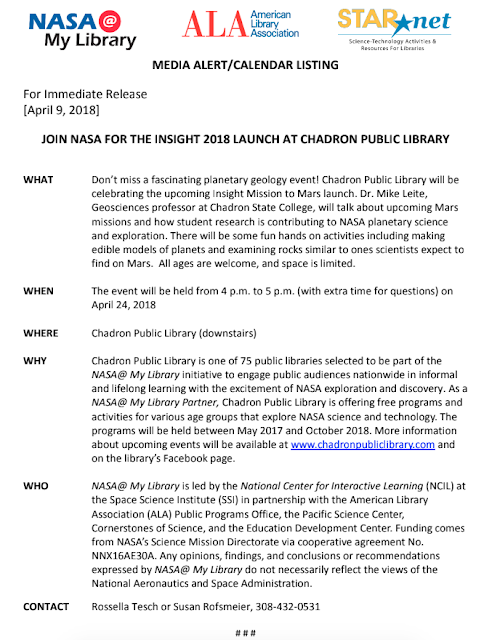 To reserve seats, please call 308-432-6302 or email sfrench@csc.edu. relationships, as well as how they’ve found solutions and hope. Three Culinary Arts 2 students took part in a daylong session of cooking techniques, learning career options, participated in banquet preparation and menu development. The opportunity came across with an invitation to bring Chadron Culinary 2 students to an newly formed resort/restaurant in Estes Park, CO. Students worked under Executive Chef Jacob Tew and Sous Chef Kristina Olsen, both are chefs at the Latitude 105 Alehouse Restaurant located inside the Ridgeline Hotel Estes Park. The day began with the students preparing breakfast and lunch, including lessons on poaching eggs and making hollandaise sauce. During a break in the day, the hotel sales manager and executive chef counseled the culinary students on various career opportunities they would have in the hospitality industry. The Ridgeline was also hosting a 55-person banquet that night, so the students assisted with every aspect, from preparation to presentation. Ending the day on a sweet note, the students worked with the Latitude 105 culinary team to develop the restaurant’s signature milkshake specials for the week ahead. This was a true experience of a lifetime for these students to spend a day in the professional kitchen and learn more about the world of hospitality. “Working at the Ridgeline Hotel of Estes Park was one of the best experiences of my life” Paige Carratinni said. “Not only is my career choice now fully cemented in the culinary and hospitality field, but the interactions, connections, and memories I made in the kitchen are ones I will never forget.” Paige was joined by classmates Aubree Noble, Lindsay Tobacco and their instructor Brenda Budler. After months of district competitions and team practices, members of the Chadron FFA Chapter put their hard work to the test while competing at the state convention during the week of April 3rd-6th 2018. The students left early on a snowy Tuesday morning and returned Friday evening after spending a busy few days in Lincoln. A total of 34 students competed in 16 different Career Development Events including: Ag Biotechnology, Ag Communications, Ag Mechanics, Agriscience, Agronomy, Environmental and Natural Resources, Farm and Agribusiness Management, Floriculture, Food Science and Technology, Livestock Evaluation, Livestock Management, Meats Evaluation and Technology, Nursery and Landscape, Poultry Evaluation, Veterinary Science, and Welding. Chadron students came home with 13 total team ribbons, and 36 total individual ribbons. The chapter had great success! There were over 7,000 members who descended upon UNL East Campus, Pinnacle Bank, Southeast Community College, and several downtown hotels to compete at state convention. out of 96 total students. and were district champions going into state. In Ag Technology and Mechanics, the team worked together to place 15th out of 49 total teams. 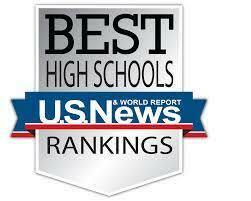 Lemmon placed 88th all out of 196 students. of the team and helped to the team placing. of the Agronomy team and contributed to the overall placing. Cole Madsen who placed 162nd out of 326 total students. had qualified for this event and were district champions going into state. the poultry division, placed third in Dairy, and 4th in Equine. 76th, True Thorne placing 189th out of 420 students. Lance Cattin was part of the team. district Livestock Management contest to be eligible to compete. MIG to help out with the overall team standing. road along and helped out as additional chaperones. All in all, the Chadron FFA Chapter had a very successful year, and is sad to see it come to a close. The High School sports physicals are scheduled for Wednesday, May 2, 2018 at 7am in the High School Gym/locker room area. The school nurses are sending home a sports physical form. We request that parents/guardians fill in the Health History and sign permission at the bottom of physical form. Then return the completed form to the high school by April 20, 2018 along with $5 donation. giving an opportunity for your student to get the physical done at school. Your student MUST have the form signed and returned to receive a physical. If the form is not completed and signed by the parent/guardian, the student will not receive a physical. All physicals will be done in the High School locker room/concessions area (north side). assigned for her/his grade, let us know and we will get them in on the other day! related physicals at this time. students. If you have any questions/concerns, please don’t hesitate to contact us at the school. Hope to see your student/s there! There will be no school today (Friday, April 13th) for Chadron Public Schools due to forecasted snow and wind. Activities scheduled for the day are also cancelled or will be postponed. 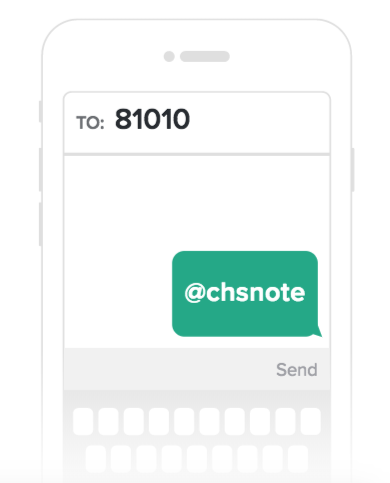 If you would like to subscribe to Mr. Mack's high school text message notices, simply text the message "@chsnote" to the number 81010. 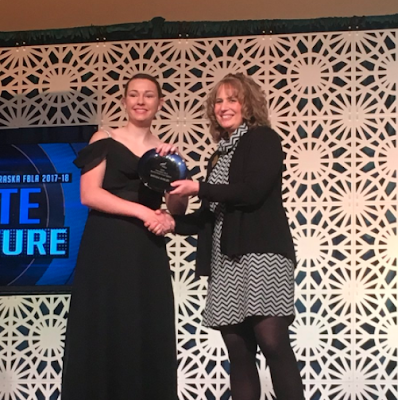 Brenda Budler Named 2018 Nebraska FBLA Advisor of the Year! Chadron High School teacher, Brenda Budler, was awarded the 2018 Nebraska FBLA Advisor of the Year during last week's State FBLA Convention. Mrs. Budler is in her 16th year of teaching Business and Foods classes at Chadron High School. 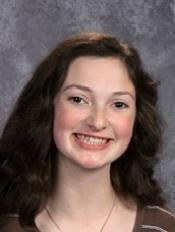 She co-sponsors the Chadron High School FBLA Chapter with Renae Noble. Weather drastically limited the number of schools attending the 2018 Chadron State College Scholastic Day Contest. However, Chadron High School students did another amazing job at the contest, especially considering that 35 other students are competing at the State FFA contest in Lincoln, 12 are competing at the State FBLA contest in Omaha, and a few others are competing at the State National History Day contest in Lincoln ...all at the same time! Chadron High Students recorded 23 first place finishes!